Starrett Automatic Center Punch with adjustable stroke. This punch has a lightweight, knurled aluminum handle for a positive grip and easy handling. No hammer is required! Just hold the punch in an upright position, press the handle down, and a built-in mechanism strikes a perfect center mark every time. The force of the blow can be adjusted by turning the knurled cap. All working parts are made of tool steel, properly hardened. The hardened tool steel point can easily be removed for resharpening or replacement. 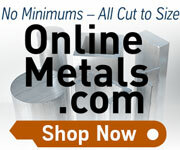 Works on metal, plastics, wood and other machinable materials.